Plovdiv Tumbler – also known by the names: Plovdiver Tümmler , Culbutant de Plovdiv – pigeons In the city of Plovdiv and the surrounding towns and villages are created and raised by several centuries of native breeds of pigeons, which we can meet today in almost the entire country. 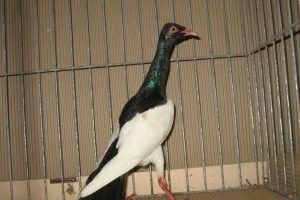 In fact, it is the same breed of pigeons, which have the same uniformity, flight, voice and temper, but differ only in the pattern. 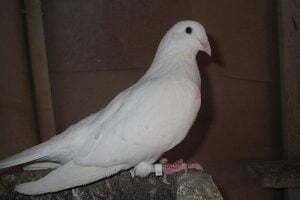 However, due to the established tradition, we will describe the individual pigeons that are only small in their pattern as individual breeds, as is the case in modern world mushrooming. 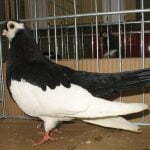 All pigeons of Plovdiv breeds have a very lively and lively temperament, they are good pilots, exceptional parents, who, if not separated in autumn and winter, lay all year round. Unlike Sofia White-tailed, very few of them are sweets. 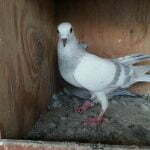 Strong and healthy pigeons. 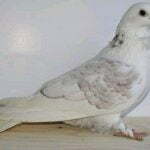 The Plovdiv Akman is a dove of the same type, the difference being only in the pattern. It is the famous pattern of “swallow-type” or “saddle-type”. Colored are the top of the head, neck, back and tail. On the front of the throat there is a white blob, like a baby’s muzzle, which starts from the lower jaw, passes to the eye 2 mm beneath it so that a small tongue is formed beneath the eye, then a slight 3-5 mm envelope eye ring and horizontally extends almost to the back of the neck, from where it descends to the chest almost vertically and ends with a continuous line of shoulder height. Wings and abdomen are white as well as hip fever. 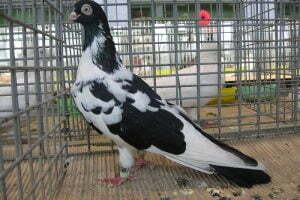 Plovdiv’s black pigeon is also known as ARAP.All the generic features described in the whitestones also apply to the black. The only difference is that this pigeon is entirely black or red. There are almost no specimens in yellow and gray. The whiteflight is also known by the name CHAPAR, which probably means the same in some language. 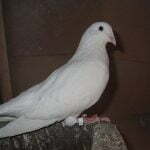 A dove with a similar pattern is grown in Hungary and is called a Hungarian CHAPOSH, a great surprise for our great colleagues and Hungarian colleagues.The breed is mainly grown in black, less often in red and very rare in yellow and gray.